First Steps to Fitness is my online course. I have been working on it for about 18 months now, and it’s ready to fly free in the big wide world. Ever since qualifying as a PT I have wanted to support inactive women (as depicted in the left picture above) who are feeling generally meh about life: low in confidence, sluggish, lacking energy, maybe bigger than they want to be, to feel awesome. A lot of beginner fitness programmes start at an hour, or 25 squats and 12 burpees, and so on. When actually, there are plenty of people for whom that is WAY too much. So what do you get in First Steps? Well, for now let’s just talk about the standard version. There is also a deluxe and a VIP iteration, and they have extra awesomeness on top of the already awesome basic course! First up you get lifetime access to the course. No time limit to complete it, you can go back to any modules you want to repeat any time you want to. So what is covered? Well, the modules cover mindset, body confidence, overcoming barriers (or are they excuses?! ), relationship with food, how to use everyday items as fitness equipment, and how to identify the sort of exercise or activity that is right for YOU, so that you’ll keep at it and actually enjoy it. What else do you get? Each module has worksheets for you to complete, to help you identify key issues and work through them. There is also a bank of short exercise videos that you can download and do at home whenever you want. And you get peer support in a dedicated Facebook group. The beauty of it is that there is no minimum fitness level to be able to start. You don’t need a gym membership, or hours of time. Interested? Want to know more? Here’s the full blurb and how to sign up. Why trust me with your fitness? I sometimes forget that my blog is out there for anyone to see, and that therefore there are people (shock horror) who I don’t know who might read it. So I thought I’d introduce myself, and tell you a bit about why I’m a little bit different to many personal trainers/fitness people out there. I’m Emily. I am a 42 year old living in rural Norfolk in the UK. As you can see from the photo, I have dogs. There are 6 in total. I have done a lot of different jobs over the years. 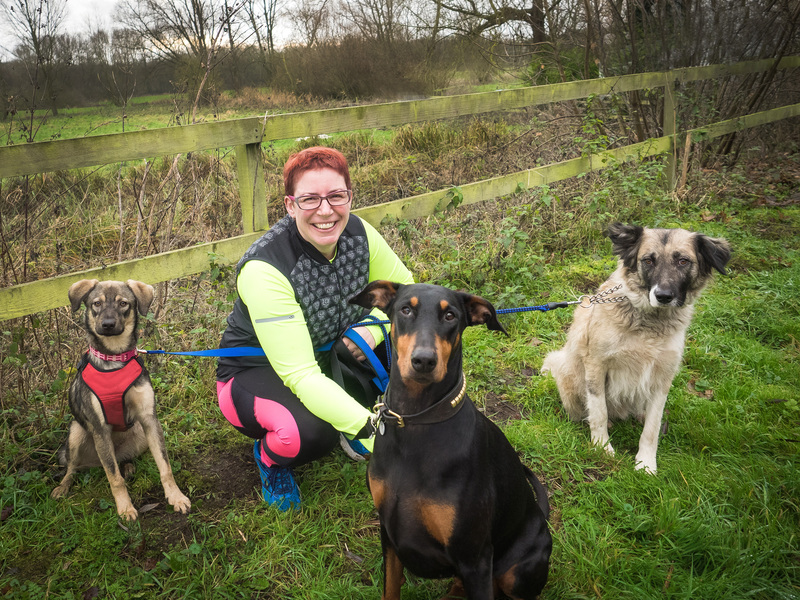 It took me a long time to realise that my passion was to support women to get more active, because I didn’t really believe I could be a fitness professional. Why so? Well, because I was never the sporty person at school. I took up triathlon in my 30s as a bit of a challenge, and thoroughly enjoyed it, although I was very slow. Around that same time I started to feel the pressure to be a certain size more than I ever had. I mean, as a teenager and in my 20s I’d always believed I was too big, yet looking back at photos I absolutely wasn’t. But I’d never followed an official diet, rather I’d just cut back on fun stuff until my weight went down a bit, then started up eating it all. I see now, with the benefit of hindsight, that although this wasn’t done in a structured way, it was still classic yo-yo dieting. This size pressure led me to a diet club for the first time in my life. I felt quite uncomfortable the first few meetings when there were people who had maintained or gained weight, while I was losing weight with apparent ease. Indeed for the first few months I didn’t comprehend how anyone couldn’t lose weight. Of course that honeymoon period came to an end. I started to crave the old foods I’d always eaten, and would exercise more to “allow” me to eat beyond what the diet club suggested. I felt like I was managing to cheat the system. “Goodness this is easy, why haven’t I done it before?”. You know. That smugness that comes before the lesson!! A couple of years after joining, I realised I hadn’t addressed my body image. I hadn’t looked at my relationship with food. I had simply added guilt to a long line of yo-yo dieting. And I was gaining weight. How come I now couldn’t lose? Why wasn’t it working any longer? I looked around me and realised that I had become one of those people I felt uncomfortable for when I first started. So I eventually stopped going. (There was quite a long time when I hovered in the self-loathing hinterland, believing I must be a failure because it had been so easy initially). And got a stressful job. And put on weight. Quelle surprise. Fast forward 6 months and I left the job, but was the heaviest I had ever been. It was time to work out what I was going to do with my life work-wise, and it was also time to address whether I was going to diet again or learn to love my body as it is. Because being active makes me feel so good – I’m not necessarily talking going to the gym or cycling miles, although personally I do like those, rather I’m talking moving, simply moving. I (with some help from a friend) realised that getting qualified as a personal trainer would be a great way to be able to help women like me. Women who were sick of the diet treadmill and who wanted to feel great about themselves. Surely if I wanted that, others would? Getting qualified made me address my body hang-ups. I can demonstrate an exercise just as well as someone who is a size 8. I can support someone to feel ace about themselves better than someone who has never dieted or felt guilt around food. 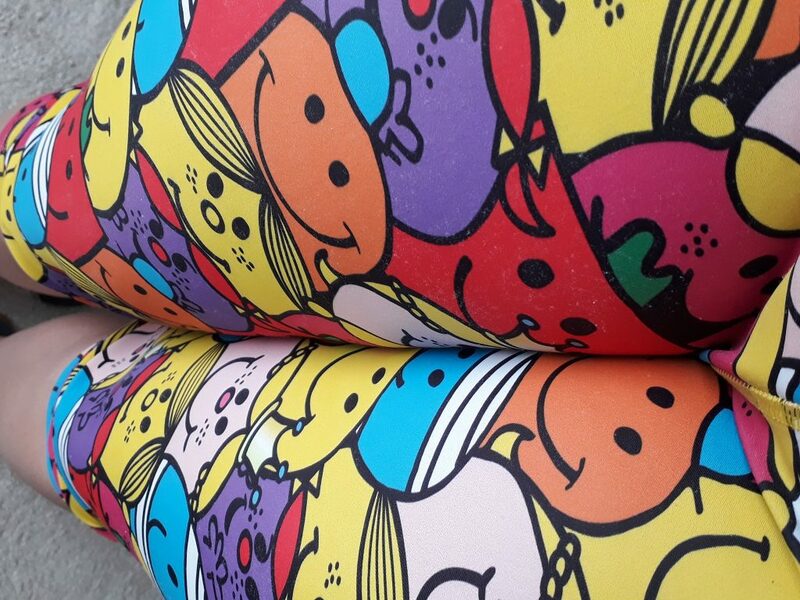 I can rock my funky gym leggings every day, and feel proud of the body that supports me through all this. And do you know what… I can help other women feel great too. In qualifying as a personal trainer, one must study basic nutrition. The aim being to “help” obese clients to lose weight. Much of the fitness industry is still all about getting people to be a smaller version of themselves. And that’s fine, but it’s not for me. For me, it’s about helping people to move more. To be able to live their life more fully. To be able to feel confident in their awesomeness. The scales have nothing to do with that. Your weight (and mine) have no bearing on how active we are and how happy we are and how utterly brilliant we are. If this rings true with you, if you’re sick of defining food as “good” or “bad/naughty”, if you’re over feeling sluggish but know that the gym is too daunting a place for you right now, then I’m your lady. And if you love dogs as much as I do, well then we’re doing well. And if you want to be able to enjoy cake and wine because they are just normal parts of life, then you need to be in my gang! To join my gang, and for support, hints and tips, sign up to my mailing list or head over to my Embracing Fitness community Facebook group. I have been skirting around wholeheartedly embracing the body positivity movement for various reasons, but I realised that the only way I can properly support women to grow in confidence while getting more active is to establish my take on it. We all have a body. The size of our body doesn’t define how intelligent, kind, happy or sad we are, however much society might try to tell us otherwise. The inherent message is out there that if you are anything bigger than a size 12, you are a failure, you must be miserable, and you can’t possibly be living a fulfilling life. Furthermore the message is that you are unhealthy. Let’s unpackage that a little. If size 12 (or 10, or 8) isn’t your natural size, then you will be constantly depriving yourself to achieve the clothes size society wants you to be in. That doesn’t sound intelligent, kind or happy to me. The idea that being larger than BMI 25 (don’t get me started on BMI – that requires a whole separate soap box!) immediately makes you unhealthy is unhealthy in itself. Yes, there are some conditions that can be exacerbated by carrying extra weight. Absolutely, I accept that. However, losing weight just to be within the correct range of numbers is just as unhealthy, both mentally and physically. There isn’t much research into the effects of yo-yo dieting, but this article is worth a look https://www.medicalnewstoday.com/articles/323723.php if you’re interested. Add to this that only 3-5% of all dieters keep all the weight off long term, and I hope you’ll agree it’s time to attack the fat stigma and embrace the positivity. So, what is my understanding of body positivity? 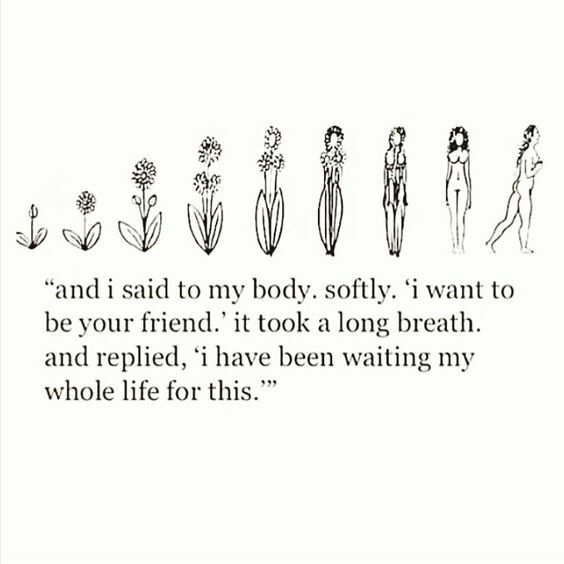 It’s about accepting the body you are in. Being kind to it. Limiting the negative self-talk. Asking yourself “would I say that to a friend?”. I absolutely understand that when you’re surrounded by messages telling you that you should be slimmer, younger, blonder, smoother-of-skin and so on, it’s pretty hard to break the cycle of negative self-talk. I also understand that for many of us, being surrounded by those messages only reinforces the desire to eat more, because we’ve already “failed” so we may as well eat all the cake. Where do we start to change this? Well, each and every one of us can make little changes. 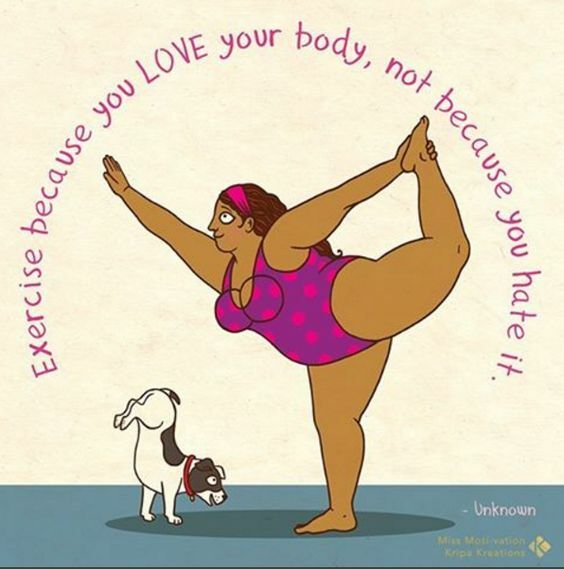 Rather than constantly looking for the negatives (“I’m so fat, I can’t do X,Y,Z”, for example; “I’m such a failure because I ate more than 3 lettuce leaves today”; “I must have no willpower cos I can’t lose weight”; and so on), let’s start looking at positives: “My body is awesome, it can do A,B,C”; “I need more than just lettuce to survive – my body knows what food it needs”; “If negative dog training doesn’t work, why do I think depriving myself and constantly treating myself negatively is going to work – let’s start being positive”. So what positives can you cite about your body? What can your body do for you today? How can you start to focus on the good things, and treat yourself like you’d treat a friend? And yes, I know that the body positivity movement is way bigger than this, but for today, that’s enough of my take on it. I don’t think I’m alone in finding getting outdoors therapeutic. I love to walk with my dogs, I love to run (slowly, and chattily) with friends, I love to ski. Do you know what I love most with these activities? The chance to clear my head. The chance to mull over stuff that I need to find an answer to. The chance to talk through things that haven’t quite made sense. You see, if I walk alone I find that in the very act of moving myself forward while filling my lungs with air, my head finds new ways to process information. Swimming does the same, so long as there’s nobody getting in the way in the lane!!! Honestly, I often find that if I sit at my desk and stare at a list, the inspiration simply never comes, yet as soon as I grab a dog or two and start walking the solution presents itself. And if I walk or run or ski with others, what’s the benefit? Well, being side by side with someone, rather than face to face, makes it easier to talk about things that have been upsetting you. Face to face insecurities kick in – should I word it like this or that, will someone take offence, will I go red – but side by side brings a freedom. Add the fact that you’re moving, you’re outside so the scenary and surroundings are constantly changing as you go forwards, and you can unburden yourself of things you never thought you would be comfortable talking through. And your companion, because they are also moving and observing ever-changing scenery, is much more receptive to hearing you and absorbing the information. Try it, it’s liberating. Find a close friend and just walk with them. Talk through things you have been worrying about and see how you get on. Report back (doesn’t need to be in detail, don’t worry!) in my Embracing Fitness community on Facebook. As Dr Seuss says: Today you are you! That is truer than true! There is no one alive who is you-er than you! When we get caught in a cycle of being inactive and feeling sluggish it can be very easy to believe our body can’t do much. It’s easy to get into a negative self-talk cycle. However, with a bit of time and persistence you can undo that negative self-talk. You can move over to what’s awesome about YOU. Old voice might say “oh, I can’t run quickly, I’m always slower than anyone else and I look like Phoebe from Friends, there’s no point being more active”; to which new voice might respond “I am so lucky to have a body that can support me to walk and start to run”. When old voice says “well, of course I can’t do that”; new voice can pipe up with “why the hell not?”. Old voice “they’re all better than you, of course they are”; new voice “none of them is better at being ME than I am”. Old voice “if I do X/Y/Z I’ll only fail”; new voice “but imagine the fun to be had in trying – imagine the funny stories that might come from it”. OK, that’s lovely and all, but how do I stop believing old voice? Well, start with making a list of all your positives. It might be how you make a cup of tea, your amazing cake baking skills, those hugs you give when friends are in crisis. Perhaps it’s that you always remember the punchline to jokes. Perhaps it’s that you always forget the punchlines to jokes and your friends love you for it. Go on, grab a piece of paper now and list your positives. Only the positives. And don’t worry if the list is short to start with – it’s difficult to switch over to focusing on positives – keep adding to the list as you think of things. Then keep the list somewhere you can see it so you start to remember all these amazing things about you. All the things that make you YOU. For 2018 I set myself the target of 2000 self propelled miles. That could include bike, run, walk, ski, swim… anything that didn’t have an engine. 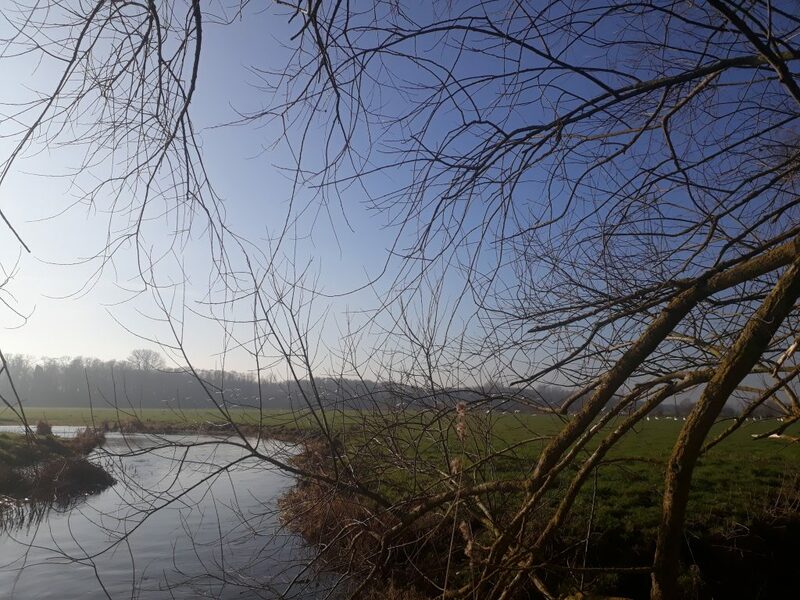 By March I was well on track to achieve the goal for the year, although I was struggling with concentration, energy levels, unexplained weight gain, crazy emotions (towards the end of 2017 I had to pull over and sob for 5 minutes after a moorhen ran out in front of the car and I clipped it), and much more. In April I finally had some tests done to try to understand why I wasn’t right. Turned out my cortisol (the stress hormone) levels were, to put it politely, a bit skewed (that’s the most polite way I can put it!!). This was my body’s way of saying “NO MORE STRESS”. The technical term is Adrenal Fatigue. Now, you’ll read everywhere that exercise helps reduce stress. Well, yes it does. If you’re inactive then moving more definitely helps, however there’s a tipping point beyond which exercise, in particular cardiovascular exercise, adds to the stress. For the 4 years leading up to this diagnosis I had been training for various Ironman triathlons, I had been training 6 days a week. I had also had a 6 month stint in a job that I found beyond stressful. Suddenly the stress (and therefore Adrenal Fatigue) made a lot of sense. Finally I had to take a good look at what I was doing. I had to pare back life. No more cardio exercise, no evening clients, factor in time for naps, avoid stress wherever possible. To be honest, by the time I got those tests done, I had been running on empty for a good year or more. Maybe two. So none of these changes were hard to adapt to, they were welcome. However, I still had my 2000 mile target quietly in the back of my mind, so I carried on tracking my walking miles. I started exercising purely for enjoyment. To that end I went in the river with friends, I tried aerial hoops and silks. Towards the end of the year I started doing powerlifting. I can’t lift particularly heavy stuff yet, but 2019 will see me deadlift 100kg and more. I’m VERY excited about that. Back to the miles, though. My last “proper” run was a half marathon on 8th April. Since then I have run 4 more times. Each time giving it a go to see how my energy levels fare afterwards. The first 3 times gave me a big NO. The 4th was today, so we’ll see! And the total…. 1796.3 miles. Not bad for someone who has to schedule naps into her week and who at one point was only functioning for 3 days in every 7. And for 2019? Well the goal is still 2000 miles. I am starting to get better, or at least I’m starting to manage life better, so I hope that might be achievable. But more importantly I’ll deadlift 100kg. And heavier. I love working with people who think the fitness industry isn’t for them. Using my experience as someone who has been hugely unfit to help them, as opposed to being someone who has always been super active. Because of this all too often when a client finds their way to me, I discover that in previous interactions with the fitness industry they have been given a one size fits all sort of programme, one that didn’t take THEM into account. For example, one lady in her late 50s had told the guy at the gym that she had weak shoulders, and that really she wanted to work on overall fitness and balance rather than anything specific to her arms and upper body. In her programme? Chin ups. Right. Another lady in her 30s wanted to feel better in herself and find day to day tasks easier. Her programme? Mountain climbers and burpees. OK. Someone else wanted to regain confidence after various knocks. Her plan? Focus on weight loss and feel a failure whenever the number wasn’t right. Now, I am absolutely NOT slating my fellow fitness industry people. What I am saying is that we are taught throughout the qualifications to come at everything from the fitness world not from the real world. And for anyone who has inhabited the fitness world all their life (most PTs are life-long “sporty-types” in my experience) there isn’t necessarily a difference between the fitness world and the real world. Whereas for anyone who is just dipping their toe into getting more active there can be a vast gaping chasm. So for each of the people above? Client A we did a plan that focused on strengthening her legs (she was worried about her knees getting weaker) alongside general fitness in the form of walking and swimming. Client B we looked at what tasks she actually wants to make easier. Once we had that list together, I was able to suggest exercises that specifically target the muscle groups that are required. With client C we have removed scales and numbers from any conversations, we focus on confidence and how she feels. The point of this post? Think about what YOU want from being more active. How will it make YOUR life better. What do YOU want to be able to do? And don’t worry about all the “sporty types” – they’re doing what they want to do and what makes their life better. Come over to my Embracing Fitness Community on Facebook for more support. I’ve heard all these. I’ve said quite a few myself! But *ta dah* exercise can be fun. It isn’t all treadmills and weights, group classes and lycra. It isn’t just the formal workouts included in magazines. It’s so many other fun things that as adults we find we’ve consigned to the “things I did when I was little” basket. How about resurrecting some of those? How about we redefine exercise as “moving your body while laughing out loud”? Or “getting healthier while getting happier”? Mmmkay. What do you suggest Emily? Well… I suggest thinking back to what you enjoyed as a child. Did you love doing cartwheels? Go and try again now. Did you love wheelbarrow races? Find a buddy to wheelbarrow with. Were you always climbing trees? Have a look around your local park for something suitable to clamber up. Don’t want to try childhood things? OK. I defy you to play air guitar to your favourite rock track without a) getting a sweat on and b) cheering up immensely. Yes, these are all ways to have FUN while you exercise. No gyms, no lycra. Come over to my Embracing Fitness Community on Facebook for more fun ideas. As with so many things, exercising regularly can seem a big ask when it’s not a habit. However, it can be quite straightforward to make some little changes to incorporate more moving into life. When I start working with new clients, we tend to look at what their average week looks like and what chores and fun stuff they do when. Once we’ve looked at that, we can find ways to incorporate getting more active. None of this needs specialist stuff. None of this needs a gym. None of this is big and unachievable. All of this, once it becomes a habit, is moving you further away from being inactive. This week I am doing a course. It’s the GP referral course which will allow me to work with people with various medical conditions, and is also the gateway to several further courses that I want to do. It’s 4 days of pretty full on learning, and so far seems really useful. However, it’s got me thinking about exercise guidelines vs personal capability. Over the last couple of years, for whatever reasons, my body has spent a lot too much time in the fight or flight mode, and as such I’ve been “stressed” (intentionally in inverted commas – I haven’t felt stressed, not in the way you do when there’s a deadline to meet, or a million things vying for your attention) for much of that time. Funnily enough existing like this takes its toll eventually, and right now I find myself in a sort of chronic fatigue type situation. If I plan ahead, I can find energy for what I need to do, but that’s all. This week, for example, I am finding the energy for this course but it will be at the expense of next weekend, when I will likely collapse; I spent much of last week gearing myself up for it, too. Enough of the pity party, Emily, what’s the point? OK, sorry! The point is on this course we are told the guideline amounts of exercise for people with various different conditions. Many of these conditions are attributed to sedentary lifestyles, among other things, so it makes very good sense that moving more will help. However, the guidelines seem to state that for each one ideally the person should be doing some sort of cardio exercise 3-5 times a week for 30 minutes (there are variations on this theme – I’m not for a second suggesting the guidelines are exactly the same for every condition). Now, from my new position of understanding what it is too need to eek out your energy, and from having been told that cardio exercise is one of the big stressors for my body, I am finding this all very interesting. Yes, I absolutely agree that we all should be moving more. Yes, I 100% on board that my role is to encourage people to get more active. What I am taking from these guidelines each time we get to that slide for a new condition is that getting active is the key here. It isn’t going and training for a 5k, a half marathon, a triathlon, whatever; it is moving more. For anyone with any of the conditions we are studying being more active WILL HELP. For me currently, being active HELPS, it’s just a different level of active to previously. I’m really excited to learn more and to see how I can couple this learning with my experience to better support people who are inactive to take those first steps, to find their “thing”. We all have a thing. At the moment mine is walking. I walk with the dogs, I take in the sights and sounds of nature. I used to run to achieve the same, but not for now. If you’re reading this wondering if maybe just maybe there’s an activity you could try that you just might enjoy, let me help you find it.